Opened in 1911, this was the third one to be built. Built in 1870, this is thought to be the first brick building in Waimate. Wasn’t it quite ahead of it’s time, and the first place you could get a cappuccino in NZ? 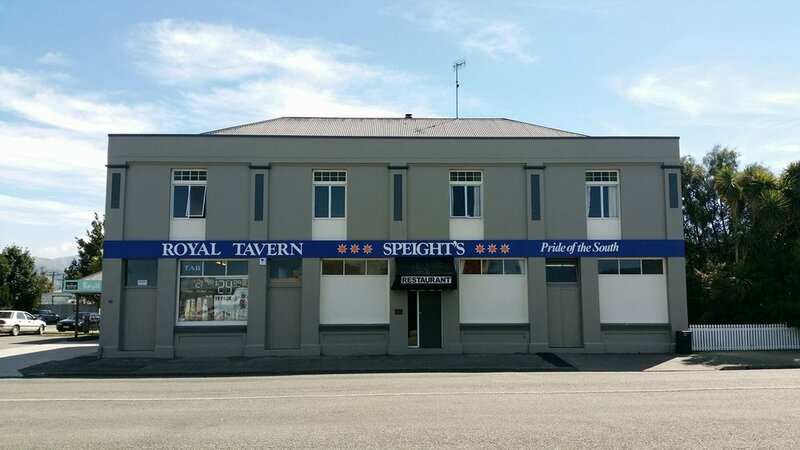 The oldest hotel in Waimate in terms of licence. Built in 1902 after the previous two burnt down. Built for Mr W McDonald in 1877. Used as a bakery until 1880, when it became a drapery. Established in Waimate 1898, by Mr J Richards. Faint advertising is still visible on the left side of the building opposite. It as painted over at the start of World War I as the word Fritz was outlawed. Built in 1908 and opened on 24 October 1909. This church replaced the original, built in 1876. The rose window at the front of the church is 4.2 metres in diameter. The three bells in the tower were cast in Belgium; the largest weighs 15cwt (3/4 ton), the other two 10cwt (1/2 ton). The church was renovated in 1954. The fourteen "Stations of the Cross" paintings are originally from St Mary's Church at Makikihi. Hannah is the name that was given to the magnificent pipe organ. Built mid 1860’s, it is the older residence still occupied in the Waimate District. The first recorded Catholic Mass was celebrated here in 1865, with eleven people present. Built in 1909, this premise operated as a paint shop continuously until 2013. Built circa 1900 - 1910 this building is named after Mrs Grigson who was the first woman in Waimate to own a business. 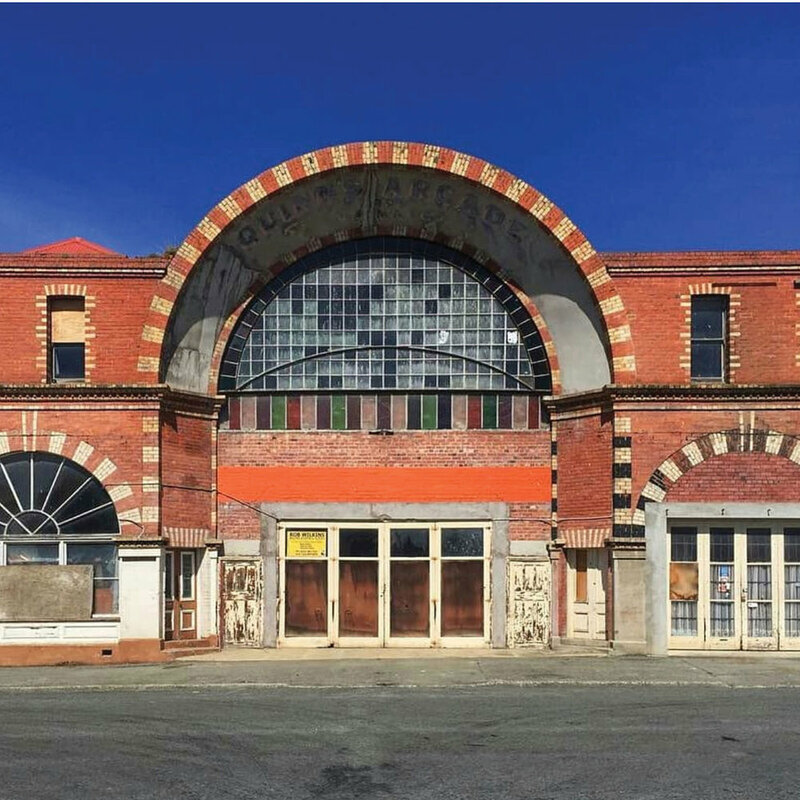 Quinn’s Arcade is one of Waimate’s most photographed and loved historical buildings. The building’s glittering past from 1906 as a shopping arcade, and later a picture theatre, is easy to imagine. It was built of Makikihi bricks fired at William Quinn’s brickworks, north of Waimate. The Arcadia incorporated an arcade of shops, a dozen on either side, giving passage through from High Street to Grigson Street. Read more here. The main museum building is the town’s former courthouse. When the courthouse opened in 1879, the only offender that day was ‘an inebriate’ who was acquitted in honour of the occasion. The courthouse closed in 1979, and was converted to a museum by the Waimate Historical Society and Archives. It’s one of the district’s most stylish buildings and attracts hundreds of visitors each year. Learn more here. Built in 1856. First opened by Kerridge Odeon. Now used for theatre productions and movies. Built in 1875. The Hotel grew to be one of the most commodious and comfortable hoteliers of the day. Built in 1934 it was the second Presbyterian church to be built. Most of the stone came from the Waihao river bed. Two windows from the old church are preserved in the bell tower. The first service was held at St Pauls Methodist Church Waimate in June 1888, after the present brick building was completed. Contains memorial windows (1929) to the district’s pioneers including the Manchester Brothers, John and George, who were the founders of the church. John Manchester was the first Mayor of Waimate. Other windows include one to Samuel W. and Eliza Goldsmith ‘Zealous of Good Works’, and to Alpheus and Anna Hayes. Formerly the residence and surgery of Dr. A G Pitts. Was a hotel from 1957. Erected in memory of 149 men and women who died in WW1. Te Huruhuru, of Waitaha, Kati Mamoe and Kai Tahu descent, was chief of Te Waimatemate Pa. In 1854 Te Huruhuru met Michael Studholme and came to an agreement with him about the new settlers’ occupation of the land. This monument was laid in 1934 to commemorate the meeting place between Chief Te Huruhuru and Michael Studholme. It was officially opened by Joseph Thomas Te Huruhuru (grandson) and E.C. Studholme (son). The painted silo overlooking the monument also commemorates this meeting. This Whare on the corner of Seddon Square was built during Waimate's fiftieth jubilee in 1929. It was built in recognition of the goodwill between Chief Te Huruhuru and Michael Studholme. This band rotunda was officially opened on June 23, 1911. It was built for the commemoration of King Edward VII. It's in Seddon Square in Waimate, a great little park right in town. Talk about gates here and whare and crucikshank. 1939 - 1945. Memorial to 91 men. Houses clock and bells belonging to the people of Waimate since 1911. 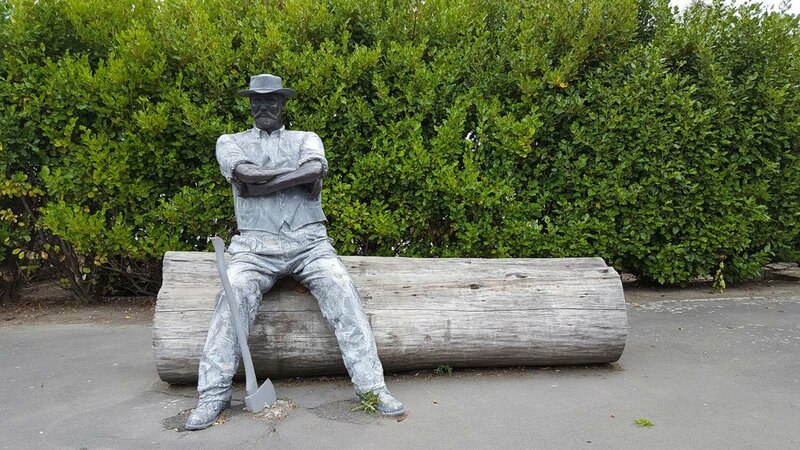 Waimate's history as a sawmilling town was acknowledged with the life-sized bushman sculpture in November 2006. Christchurch sculptor Donald Paterson worked on the sculpture for nearly 12 months. In the mid 19th century Waimate was a small village surrounded by about 1200ha of native forest. By the 1870s hundreds of men were employed at five sawmills operating in the bush. In 1878 nor-west winds fanned a fire which burned for eight days. Five sawmills were destroyed and 70 houses burned, but no lives were lost. The land for the church was given by Michael Studholme. Matai and totara trees were hauled from the Waimate forest in 1872 to build the church. Designed by Benjamin Mountford, the church was built by J.W. Gaitt and G. Dickson for 350 pounds. The distinctive St Augustine's lantern tower was built by S. Collett, using local kahikatea, when the church was enlarged in 1889. Among the beautiful stained glass windows is one on the side of sanctuary based on the design of Sir Edward Burne-Jones, a leading artist. The church has two of New Zealand's few stained glass windows designed and manufactured by the English firm of Morris & Co. In 1902 the Lych Gate was given by Mrs Michael Studholme in memory of her husband and their two sons. 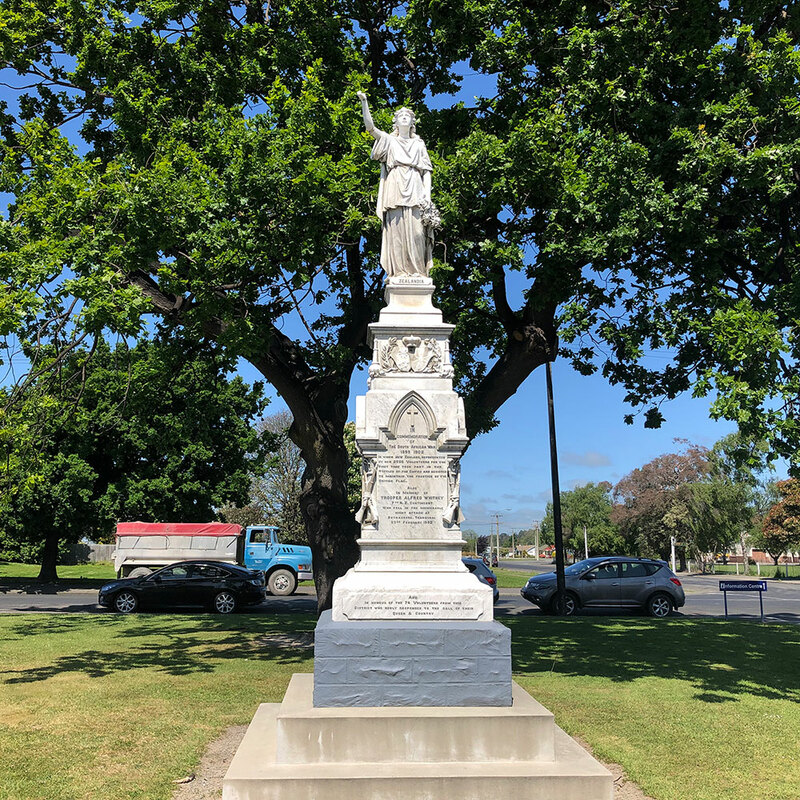 Waimate’s South African War Memorial. The memorial was unveiled on the 6th October 1904. Zealandia was the daughter of Britannia. She's a part of New Zealand’s coat of arms. Known as the ‘cyclists hotel’ during the first half of the century. Used by the Waimate Advertiser between approx 1909 - 1930. Built in 1901 to celebrate the coronation of King Edward VII. Constructed for Arthur Jones and Co. who operated a millinery business from this building until about 1920.